Other Cast: Soubu Sakiho, Hayato Reo, Kou Erise, Sayaka Rin, Amakake Sakura, Miyako Yuuna, and Houma Toa. In the world of the Warring States, where rival warlords vied to take over all of Japan, a uniquely ingenious strategist made a name for himself: Takenaka Shigeharu (nicknamed Hanbei). Hanbei’s former opponent, Oda Nobunaga, recognized his genius. When Kinoshita Tokichiro (later Toyotomi Hideyoshi) visited under Oda’s orders, Hanbei realized that he had the potential to dominate Japan—he then became his vassal and led Hideyoshi to victory in many battles. 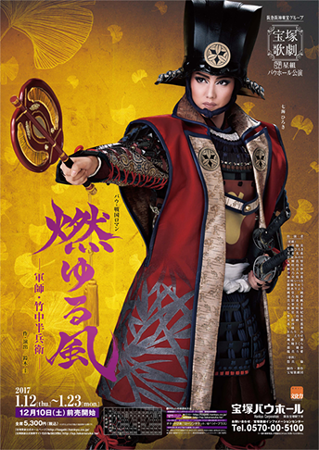 This original ‘Warring States Musical’ seeks to show Hanbei’s true character—his shy and loyal nature, as despite his military exploits he didn’t care about making himself famous or wealthy; his marital love with Seishitsu Ine (Tokugetsu-In) who had longed for and supported him since their childhood; as well as his deep bond with his fellow strategist under Hideyoshi, Kuroda Kanbei. Created by gabby. Last Modification: Monday 25 of February, 2019 06:27:41 PST by caithion.